Use the CB39 as an interface to adapter cables commonly used with aircraft and automotive test systems. This board permits maintenance or repair testing in space-limited environments using CableEye and a laptop computer where the original test equipment would not have access. Also use to quickly check the adapter cables themselves to insure low resistance and connection integrity. Set of two boards with expander cables. Requires 256 test points. 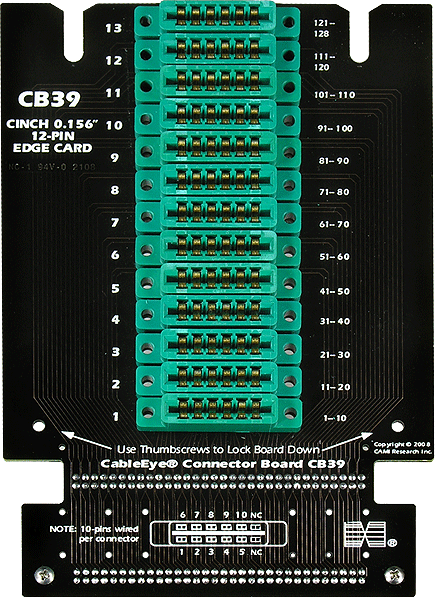 1 - Ten pins per connector are wired. 2 - Top view. 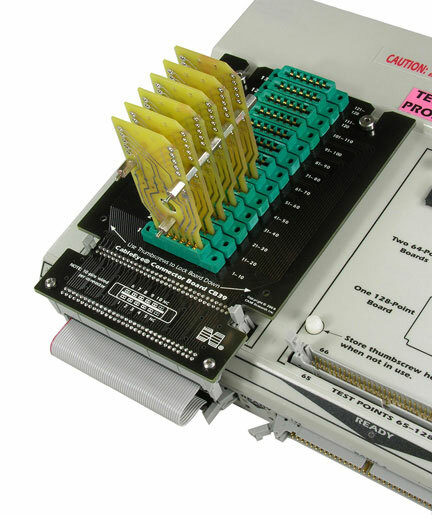 Downward-facing header on front of board connects to an expansion module using a supplied flat cable. 3 - Board mount on CableEye with example test connector (no wiring installed).